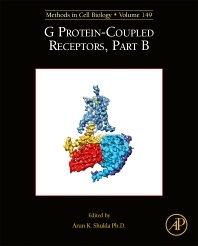 G-Protein-Coupled Receptors, Part B, 2nd Edition, Volume 149, the latest release in the Methods in Cell Biology series, continues the legacy of this premier serial with quality chapters authored by leaders in the field. This volume covers Optical Approaches for Visualization of Arrestin Binding to Muscarinic Receptors, Luciferase Reporter Assay for Unlocking Ligand-mediated Signaling of GPCRs, Assays to Measure GPCR Dependent Cellular Migration, Characterization of the Frizzled GPCRs, Binding Assays for Bradykinin and Angiotensin Receptors, Detection of Misfolded Rhodopsin Aggregates in Cells, Measuring GPCR Ubiquitination and Trafficking, Culture of Primary Neurons and its Use in Studying GPCR Trafficking, and much more. Dr. Arun K. Shukla obtained his M.Sc. (Master in Science) from the Center for Biotechnology at the Jawaharlal Nehru University in New Delhi, India. Dr. Shukla did his Ph.D. from the Department of Molecular Membrane Biology at the Max Planck Institute of Biophysics in Frankfurt, Germany. His Ph.D. research work was focused on structural studies of G Protein-Coupled Receptors (GPCRs). Dr. Shukla subsequently carried out his post-doctoral work in the Department of Medicine at the Duke University in North Carolina, USA. During his post-doctoral research work, Dr. Shukla focused on understanding the biophysical and structural basis of ß-arrestin mediated regulation of GPCRs and non-canonical GPCR signaling. Dr. Shukla has served as an Assistant Professor in the Department of Medicine at the Duke University in Durham, North Carolina, USA. Dr. Shukla is currently an Assistant Professor in Department of Biological Sciences and Bioengineering at the Indian Institute of Technology, Kanpur, India. Dr. Shukla is also an Intermediate Fellow of the Wellcome Trust-DBT India Alliance. The research program in Dr. Shukla’s laboratory is focused on understanding the molecular mechanism of activation, signaling and regulation of G Protein-Coupled Receptors.